I told myself I’d read one more “real” book before school started. By real I mean, one book that, once classes begin, and my mind turned a bit towards jello in the evenings, I would not be able to read in any reasonable amount of time, and would therefore forget so much about between sessions that it would become a jumble. I learned this about myself some years ago, after several abortive during-the-school-year attempts to read The Brothers Karamazov. 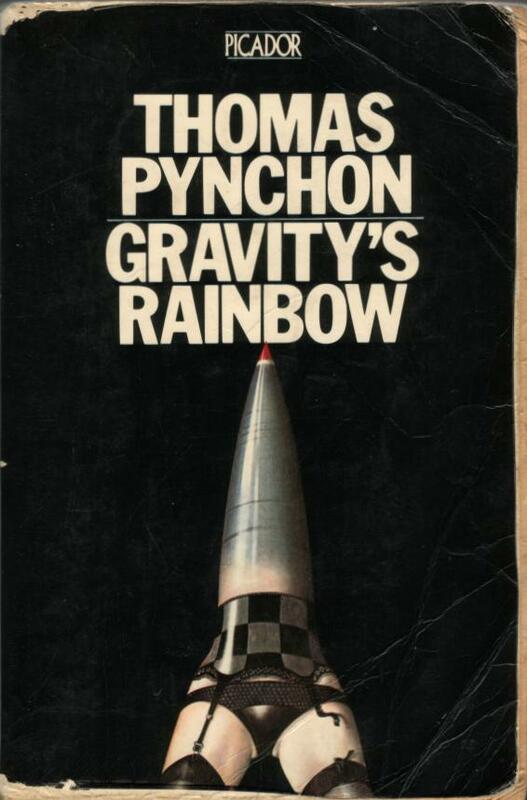 So, I guess against fashion, my summer “beach reading” inclines towards massive, incomprehensible tomes like Thomas Pynchon’s 1971 behemoth – Gravity’s Rainbow. I had taken a couple of whacks at Pynchon before. A friend is working on a Master’s Thesis about Pynchon’s 1995 Mason & Dixon, so as a vote of confidence, I read that last year (in fact during the school year, but in 45-minute chunks on the Metra in the mornings, which kept me somewhat clued-in, though not entirely). Otherwise, I tried and failed to read Against the Day when my wife got it for me as a Christmas present the year it came out (school started again when I was on like page 150). I did read Inherent Vice (what one friend called “Pynchon lite,” which is fair in some ways) and also Bleeding Edge, Pynchon’s 9/11 novel, which was, by Pynchon standards, almost absurdly straightforward, even linear. About 15 years ago, I read The Crying of Lot 49, which is approachable, and though I don’t remember the details now, I remember this sense of having been profoundly screwed with by the time I finished it: it left me with a sense of paranoia, a suspicion that every homeless person I saw was actually a member of a covert and illegal postal service. I began Gravity’s Rainbow while stretched out on a towel at Chicago’s Oak Street beach, on an 80+ day a few weeks ago. At first it was tough to follow, just because it’s tough to follow, but also because any number of groups of high school students taking interminable numbers of selfies and loudly pontificating over the etiquette of Intragram posting kept coming in droves. Each time, finally, I put on my headphones, though that didn’t help so much either, because no matter what other stimulus is coming into your brain, Pynchon is just hard to read, at least for me. In fact, this last failed reading experience led me to spend most of the time reading the book as though it were music, specifically the sort of classical music you have to listen to several times before it doesn’t all sound the same. The trouble is, though it takes 25 minutes to listen to a Bach partita, so if you do it 5 times in 5 days, you’ll start to catch on, Gravity’s Rainbow is 776 pages long, so you’re just not going to read it several times fast. I found myself in the position of having to read it and as the chapters went along, start to listen for things that I had heard in earlier chapters, sort of like the things you’d hear in Bach on the second listening, but it’s not the second listening, it’s just the second chapter. That’s made tougher because Pynchon seems to be operating on the premise that this is exactly what a reader might be trying to do, and of course, why make it easy on them? Any hints of continuity seem to be continually undermined, at least from one perspective. Which led me towards an analogy I could grapple onto a bit: Pynchon is very much like atonal music (and perhaps intentionally so). Schoenberg and others wrote music in the early part of the 20th century with the goal of undermining tonality. Rather than working from a major or a minor scale, which focuses on 8 of the 12 semitones that make up a proper octave (hence “OCTave”), which gives a lot of the music we know a sense of continuity – songs tend to start and end on the same notes, progress consistently from the “tonic” (the first note of the scale) towards toe “dominant” (the 5th) and then back to the 1st (often by way of the 4th in ways I don’t really know enough about to say much more than that) – rather than all that, Schoenberg et al wrote music that tried to use all 12 tones with a similar frequency. The idea was the break the audience of its expectations of tonality, and thereby discover new possibilities of musical meaning. My experience of listening to that music is generally one of spiraling out of control – I keep expecting some sort of closure, and I don’t get that, because something new starts. Nothing finishes. Now many listening gets you towards something like closure, but you have to construct it mentally through other tools than tonality. I’ve had this experience with Schoenberg’s Piano Concerto – it does have a sense of progression, though the first 10 times I listened to it, it just seemed random. In fact, that sense of progression may be entirely fabricated by me, but that may be the point. So, Pynchon – a lot of it works just the same way. What I think has been referred to as “shaggy dog” storytelling (if you’ve read a lot kids books, this is a bit like what If You Give a Mouse a Cookie does) – “if you give a mouse a cookie, he’s going to need a glass of milk. And if you give him a class of milk, he’s going to need a napkin..” and so on, and the story only at the end, in a bout of artificial unity, returns to the cookie. Pynchon takes all the things that work like tonality in a book – character, plot, setting – and refuses to use them in a consistent fashion, at least that how it always feels at first. You get no “protagonist,” because the narrative focus keeps changing. Now when you’re reading, you always think the first character you encounter is likely to be a protagonist, and you pay attention in that way. But then the book undermines your expectation. Gravity’s Rainbow does eventually settle on something like a main character – Slothrop – but only after you’ve almost been thrown off the scent entirely from seeking one. It’s a bit like the Richard Linklater movie Slacker. Characters walk on the screen, talk for a bit, then a side character walks off, the camera follows him, and the new scene focuses on him, until a side character walks off, and so on. The unity of character you expect keeps slipping through your grasp. In response to this, you seek unity though other means. In Slacker it’s the time of day: the movie seems to move in a consistent time sequence, and so that works to keep a handle on. It’s also all set in one city – Austin, Texas, which also provides unity. Gravity’s Rainbow rambles over time, space and character. The first 200 pages are, as of this writing, a total blur for me. It was only around then that Slothrop emerges – but even now, I can’t really tell you what his job is, or what he’s trying to do. At the beginning, which I eventually figured out was like 1945 London, he’s being observed by some sort of allied psychological-warfare division, because he has this habit of sleeping with women around London in the precise locations where German rockets later drop. One of the unsolved mysteries of the book is why this happens. There are detours through behaviorism, conditioning, probability, ballistics, and ever-present Pynchonian song-lyrics intended and/or italicized. But Slothrop is really only a “main character” for the middle 80% of the book (so in that way, he’s like Joyce’s Bloom, but not really in many other ways). But then there is the Rossini side of things. The most common thing that happens in the book is people having brief, futile but to some extent happy intimate encounters. I lost count of how many different women Slothrop sleeps with (though of course I started to suspect they were all one woman too), and Slothrop himself almost literally dissolves towards the end of the book, but then seems to re-appear in a strange place called Rocket Town. There are little romantic melodies that do not add up to some grand vision of world piece (or some equally grand dystopia). The only thing I really know about Webern is that he’s from roughly the same period as Schoenberg, and used atonal techniques. Glenn Gould recorded some of his pieces and I’ve listened to them. Wikipedia verifies that Webern was in fact killed by American soldiers, so Pynchon’s not making that up. There were parts that were certainly engrossing. One particularly effective sequence was about a German rocket scientist whose daughter was kidnapped by the Nazis. He only got to see her once a year, and he was always vaguely worried that it wasn’t her, just an actress they had sent, and he was always frustrated with himself that he couldn’t be sure one way or the other. It was told with a core of sympathy and pathos (rare commodities in this book). There were other parts that were definitely funny. A sequence early on involving Slothrop’s visit to one of his fling’s flats, where he is entertained by someone who might be her aunt or her landlady, during which he is forced to consume a disgusting, surreal but somehow plausible sequence of British flavored hard candies, with oddly juxtaposed flavors (if you’ve ever bought British potato crisps in a bar you will here a hint of reality here). There are whole sections where I was really just reading to get through them since I didn’t know what was going on the whole time. It wasn’t that different from my experience reading Finnegans Wake (though it’s generally easier-going than that). Overall, this has inspired me to try to re-read all these books, perhaps in sequence, because I’m guessing there’s much more lurking beneath (or better, within) the surfaces of this massive work. I would have a kind of methodological remark on stuff like Gravity’s Rainbow. Where exactly do we draw the line, when is something just bad literature? Gravity’s Rainbow has some good stuff, some poetic pages, but most of it, as was rightly observed in Josh’s post, is way too scattered. There are different ways of undermining convention, and not all of them are the same. For example, in a lot of novels of Robbe-Grillet, there is an undermining of plot and character, but somehow they seem more unitary. Even in books where it’s not clear if any of what is going on is true or made-up, Robbe-Grillet manages to confer unity. Some of this unity is achieved by having recurring scenes, motifs, characters (although it may not be clear what their status is). Another example: in Beckett’s The Unnameable, nothing whatsoever happens. We have some voice narrating and nothing of what he/it says can be taken for granted. That book’s unity stands entirely in its narrator, who is rambling. I guess the problem I have with Gravity’s Rainbow is that its rambling does not amount to much. In Robbe-Grillet, I think the sense that the book amounts to something comes to a large extent from the fact that the book is posing problems: problems about our epistemic access to things, problems about the traditional view of what fictional characters are, about what plot is supposed to be etc. In Beckett, the narrator has existential questions he’s rambling about: God, his own existence etc. Now, it could be said that Gravity’s Rainbow also poses problems like these. I agree. It asks questions about the ethics of war, as far as I remember. But the directions that the book goes in do not cohere. In Robbe-Grillet and Beckett, the radical style of narration was in the foreground, you were aware at every step of the radical kind of literature you were reading, and you could focus on the style, on the recurrence of motifs etc. (I would compare Robbe-Grillet’s literature to something like Steve Reich for example). The plot is not going anywhere and you know it. But in Gravity’s Rainbow, it seems to me there’s a lot of traces of the traditional way of storytelling, that you are expecting the story to go somewhere, and it doesn’t (although, judging by the way it’s constructed, I would add that it should). It seems like Pynchon is trying to do two things at once: be radical in his narration, but not break entirely with tradition (plot and such). Perhaps this is not the best explanation of the feeling some of us have that something isn’t right about a book like Gravity’s Rainbow, but it’s the best I’ve got. If I’m right, though, that there is something not coherent about this book, then maybe we should take seriously the idea that this is just a badly written book. I’m sure you could find many allusions to historical events, art, war, and whatnot, in the book. What I’m not sure is whether all that is enough to make up for the way it’s written. My conjecture is that it’s not, with the corolary that this is just bad literature. But I might be wrong. The book is pure genius and ya gotta try again! I’ve read GR twice now. The first time is pretty much as you describe it: confusing, scattered, difficult (but undeniably funny, touching, or fascinating in places regardless). But the second time, much more of the plot becomes clear, as you can focus less on the bizarre styles Pynchon employs and more on what is actually happening, who people are, and how people feel. What also becomes clear is that the novel isn’t anywhere near as random as it first seems. In fact, the macro-structure of the book is one of its strongest aspects. Consider how the first thing that happens is the launch of a rocket (Private Prentice watching from his rooftop) and the last thing that happens is a rocket lands (on a cinema). Between these points, the novel traces the arc of a rocket: it starts quickly, rushing around between characters (evocative of the rapid burning of rocket fuel and upwards acceleration); eventually it settles into following Slothrop’s search for meaning and the 00000 (like the rocket traversing the sky moving towards its target); then it scatters again as Slothrop’s sanity disintegrates (and the rocket accelerates on its fall then explodes). There is in fact a great deal of plot in GR. As you might expect from a 700+ page book, it can be difficult to keep track of exactly what links to what, who everyone is, how they fit together and what everyone is trying to do. What makes it more difficult is that the protagonist, Slothrop, also struggles to keep up with these things. What’s more, the different literary techniques; the extended digressions; the frequent shifting of focus and other things mean that there is a lot for a reader to keep track of. However, the novel does become less difficult on repeated readings. Many of its sections which initially appear random or impenetrable become clear, and the book reveals itself to be extremely well thought-out. If its plot disintegrates (in the traditional sense, it does: the protagonist essentially loses track of the MacGuffin), then its themes don’t – they add up to a very satisfying whole. To summarise: I totally sympathise with the frustrations of reading GR, but it is well worth a re-read.